It goes without saying, those who are dedicated to grow their skills and advance their careers with USA by becoming SecuritySTARS®, will ultimately reap the benefits of our industry exclusive training, development and recognition initiative. USA Security Officers Roderick (RJ) Nowlin and Graham (Danny) Humphreys, were recently recognized for performing nothing short of a miracle on July 14, 2017 when they successfully revived two-year-old Judah Anderton who had drowned in his family's pool. The Officers received accolades from both the client and the Bedford County sheriff and fire departments for their bravery, courage and commitment to readiness. USA honored both Nowlin and Humphreys with Distinguished Service Awards in a private ceremony. After trying to revive Judah, parents Benjamin and Angela Anderton rushed him to the nearest certified first responders in their remote area of Lynchburg, Va. When they arrived at the USA Officer’s guard house, Judah had been unresponsive for over 10 minutes. Immediately, Officer Nowlin began performing chest compressions while Officer Humphreys dialed 911. For over five minutes, Officer Nowlin performed CPR on the toddler while Officer Humphreys remained on the line awaiting arrival of the paramedics. By the time the paramedics were on the scene, Judah had begun breathing. The toddler was transported to University of Virginia Children's Hospital where he remained in critical condition until he was released on July 19. He is expected to make a full recovery. This story of heroism illustrates how the security company’s Officers are often called upon to be pre-first responders, while also performing duties outside of their regular job functions. The Andertons’s expereince is just one example of the better outcomes USA Officers have provided their clients this quarter. 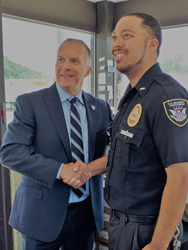 Awarded as "Security Officer of the Month" for July, Officer Salih Jasmin of Austin, Texas, was presented with the client site’s inaugural award in appreciation for his commitment to readiness and producing better outcomes. In addition to client recognition and awards for above and beyond performance, the security company regularly recognizes their Associates’ achievements and commitment to continuing education by holding pinning ceremonies. Combined with the “Security Officer of the Month” award, Officer Jasmin was recognized during a pinning ceremony for having achieved SecuritySTARS® level one certification. Also at the Austin branch, over a dozen Security Officers were recognized for having achieved their SecuritySTARS® level one certification. 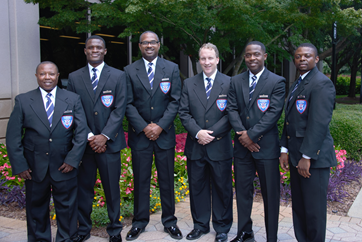 At the corporate office, Senior Vice President and head of Security Force Development, Harold Underdown, held a pinning ceremony in recognition of the following distinguished Officers who achieved SecuritySTARS® level one: John Moore, Stephen Jama, Serge Mutanda, Eugene Binyuy, Edward Toliver and Terry Burns. USA is proud to recognize their dedication to preserving a Safe. Secure. Friendly.® environment for the hundreds that occupy the corporate office. U.S. Security Associates (USA) is the market-leading, wholly-owned, American safety and security solutions provider. With over 160 locally-responsive offices, international locations and over 50,000 dedicated professionals, they offer the most complete array of physical security, remote surveillance, and global consulting and investigations to ensure better outcomes for thousands of clients and a range of industries. Innovative applications of leading-edge, proprietary technology enable USA to rank annually among the world’s best training companies, sustain the highest standards of quality, and underscore world-class customer service with unparalleled accountability. USA’s rise as one of the largest innovative security solutions leaders is a natural byproduct of these differentiators and enables the company to provide the most Safe. Secure. Friendly.® environments for people, assets, and brands. For more information, visit http://www.ussecurityassociates.com.